Plot hole: It is pretty obvious that Hercules and Iloran are not responsible for destroying Spiros' village. Spiros saw the two of them, investigating the ruins unarmed, only when all the fires had long since died down. 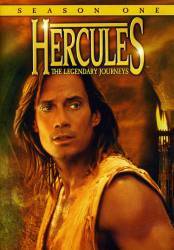 Hercules: What are you doing here? Iolaus: What do you mean? Iolaus: Yeah, well, I was kinda hoping you wouldn't notice. Autolycus: I hate to break it to you, big guy, you've got harpies. Autolycus: Gadzooks, if I were a woman I'd kiss myself.